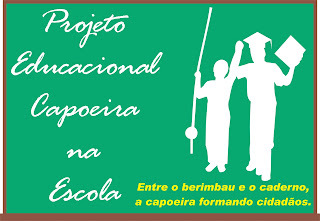 The Cultural Association Capoeira na Escola (Capoeira in the Scholl) – ACCAES - develops activities for twenty three (23) years in Florianópolis – Santa Catarina - Brazil, and always has been committed to the African descent culture as an instrument of socialization, inclusion, valuation and democratization, giving the opportunity and formation of criticize thinking citizens. More than twenty thousand children and young people have been helped and taught in public schools like; Recanto da Criança e do Adolescente Municipal (RECRIA); Casas-lar; Escola Especial Leandro de Azevedo (APAE), and general community. Due to numerous social and cultural developed projects, is described as an entity of state and municipal utilities. “Semana Afro-Biguaçuense” (African-Biguaçuense Week): Lectures, workshops, performances, films and discussion, in the week of the National African Descent Consciousness Day – November 20th - Break down prejudgment and stimulate reflection on the problems and progress of African descent ethnicity in Biguaçu – Santa Catarina – Brasil, are its objective. The “Intercambio Nacional de Capoeira” (National Capoeira Exchange): It’s an event that aims to enable students, and everyone that have interest, opportunity of deepening theoretical and technical aspects of Capoeira, knowledge Exchange with invited masters of this art, integration and interaction with the group involved with the project. It’s a time to strengthen the commitment to disseminate the African-Brazilian culture and stand up against all forms of racial discrimination. Roda da Madrugada (The Midnight Capoeira Game): From midnight to dawn, every first full moon of the January month. Informative newspaper of the African Descent Culture: Semiannual publication with informative text with photos, calendars, news and plays related to the African-Brazilian universe. * Compact Disc (CD): Declaration of love for Capoeira: The group of students who are part of the Association recorded an album of Capoeira songs. It was released in the African “Biguaçuense” Week II and is the third CD of Capoeira Songs that was released in the state of Santa Catarina – Brazil. Self-esteem and musical development were the primary guides of this work. * Book “Capoeira não é só jogo” (Capoeira is not just a game): Through the organization of texts published by members of the Association in various newspapers, websites and internal information itself, fulfilled the purpose of this book: to show that Capoeira is an excellent educational resource and formation of the Brazilian identity.